AS ANOTHER YEAR draws to a close, it’s time to reflect on the 12 months gone by. It’s easy to get caught up in the bad stuff, but we’re here to remind you that 2013 was a year of love, romance, hope and joy. Here are nine of the most heartwarming Irish tales from 2013. Pupils from Presentation Secondary School in Clonmel composed and recorded the song My Hero as a tribute to their teacher Alice Strain, who died in a tragic car accident. The song hit the top spot on iTunes earlier this month. Five-year-old Lauryn Tracy (above) was left without her pink wheelchair after the family car was stolen from outside the Tracy’s home in Enniscorthy last October. A fund to replace the wheelchair was set up after readers contacted TheJournal.ie asking where they could donate. Christopher Robertson from New Zealand and a mystery Cork woman hit it off on a night out in Galway earlier this month but never took each other’s details. After appearing in media all over the country, he found her and the pair went on a date. Cute. This sign was strung up on Bride St in Dublin on Valentine’s week – it appeared to be a proposal from someone who has emigrated. We don’t know if B did actually propose to Bunny, but we certainly hope they’re still happy together. September saw Majella O’Donnell, cancer sufferer and wife of crooner Daniel O’Donnell, decide to shave her head live on the Late Late Show in aid of the Irish Cancer Society. The resulting rush in donations shut down the charity’s website – but they still managed to raise €400,000. Irish woman Norrie first met Chicagoan Bill on a CIE bus tour in 1962. In August of this year, three children and six grandchildren later, they returned to Ireland to celebrate their 50th wedding anniversary. Aww. And Domhnall meeting his hero Robbie Keane on the Toy Show. Easily the highlight of this year’s show, the look on Domhnall’s face when Robbie Keane appears would melt the heart of the most seasoned of Grinches. Email “8 unbearably heartwarming things that happened in Ireland in 2013”. 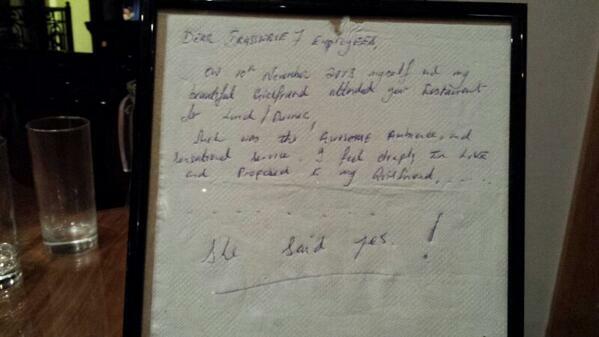 Feedback on “8 unbearably heartwarming things that happened in Ireland in 2013”.